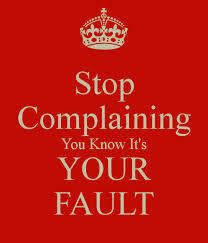 You thought it , so stop complaining! Yup, that’s right. Still working out the issues from 6 months ago I assume. I can complain about how bad things are and why it has not changed, but, I can’t. I put myself in this position. It’s working through the years of over grown weeds that I let grow. I’m not complaining or venting, it is simply an observation. I have seen change, I really have and all for the better. I stop myself from worrying and fears. I look forward to the future and what I am becoming, a great person! “I can be, what I will to be!” is the phrase I say over and over out loud. I am working on patience and weeding my garden. So, this week the big Ah-Ha moment was, I thought it, so stop complaining! I looked back at last year and and ran through the most common thoughts I was having. That has all changed and in a very big way! I gain more and more faith daily in myself! I gain ideas in marketing that I would have never thought and that have huge possibilities. The money part is slow to grow but I see the seeds taking place. I have not touched them in the last week and I’m letting them grow. I am doing the work and getting more and more excited about the direction my world without is going (because the world within is is amazing, luxurious, happy, motivated and loving). 18. We are first to believe that our desire has already been fulfilled, its accomplishment will then follow. This is a concise direction for making use of the creative power of thought by impressing on the Universal subjective mind, the particular thing which we desire as an already existing fact. This works both ways, positive and negative. My present thoughts now working in overdrive on the positive and biding my time until the Law of growth shows my present thinking in the present material world. Ha Ha. I use the line: “I’m not complaining, it is simply an observation.” often myself. I now know that even the observation has to be on the positive, not the negative. Nice blog. Makes you think. How often are we observing the result of what is no more than our own fault. I thought it, so stop complaining!